In sixteenth-century Europe, witch-hunting was class war by the elite. Excerpted from Caliban and the Witch (2004, Autonomedia). The witch hunt rarely appears in the history of the proletariat. To this day, it remains one the most understudied phenomena in European history, or rather, world history, if we consider that the charge of devil worshipping was carried by missionaries and conquistadors to the “New World” as a tool for the subjugation of the local populations. That the victims, in Europe, were mostly peasant women may account for the historians’ past indifference towards this genocide, an indifference that has bordered on complicity, since the elimination of the witches from the pages of history has contributed to trivializing their physical elimination at the stake, suggesting that it was a phenomenon of minor significance, if not a matter of folklore. Even those who have studied the witch hunt (in the past almost exclusively men) were often worthy heirs of the sixteenth-century demonologists. While deploring the extermination of the witches, many have insisted on portraying them as wretched fools afflicted by hallucinations, so that their persecution could be explained as a process of “social therapy,” serving to reinforce neighborly cohesion, or could be described in medical terms as a “panic,” a “craze,” an “epidemic,” all characterizations that exculpate the witch hunters and depoliticize their crimes. Feminists were quick to recognize that hundreds of thousands of women could not have been massacred and subjected to the cruelest tortures unless they posed a challenge to the power structure. They also realized that such a war against women, carried out over a period of at least two centuries, was a turning point in the history of women in Europe, the “original sin” in the process of social degradation that women suffered with the advent of capitalism, and a phenomenon, therefore, to which we must continually return if we are to understand the misogyny that still characterizes institutional practice and male-female relations. Marxist historians, by contrast, even when studying the “transition to capitalism,” with very few exceptions, have consigned the witch hunt to oblivion, as if it were irrelevant to the history of the class struggle. Yet, the dimensions of the massacre should have raised some suspicions. as hundreds of thousands of women were burned, hanged, and tortured in less than two centuries. It should also have seemed significant that the witch hunt occurred simultaneously with the colonization and extermination of the populations of the New World, the English enclosures, the beginning of the slave trade, the enactment of “bloody laws” against vagabonds and beggars and it climaxed in the interregnum between the end of feudalism and the capitalist “take off” when the peasantry in Europe reached the peak of its power but, in time, also consummated its historic defeat. So far, however, this aspect of primitive accumulation has truly remained a secret. What has not been recognized is that the witch hunt was one of the most important events in the development of capitalist society and the formation of the modern proletariat. For the unleashing of a campaign of terror against women, unmatched by any other persecution, weakened the resistance of the European peasantry to the assault launched against it by the gentry and the state, at a time when the peasant community was already disintegrating under the combined impact of land privatization, increased taxation, and the extension of state control over every aspect of social life. The witch hunt deepened the divisions between women and men, teaching men to fear the power of women, and destroyed a universe of practices, beliefs, and social subjects whose existence was incompatible with the capitalist work discipline, thus redefining the main elements of social reproduction. Contrary to the view propagated by the Enlightenment, the witch hunt was not the last spark of a dying feudal world. Witch-hunting reached its peak between 1580 and 1630, in a period, that is, when feudal relations were already giving way to the economic and political institutions typical of mercantile capitalism. It was in this long “Iron Century” that, almost by a tacit agreement, in countries often at war against each other, the stakes multiplied, and the state started denouncing the existence of witches and taking the initiative of the persecution. Before neighbor accused neighbor, or entire communities were seized by a “panic,” a steady indoctrination took place, with the authorities publicly expressing anxiety about the spreading of witches, and travelling from village to village in order to teach people how to recognize them, in some cases carrying with them lists with the names of suspected witches and threatening to punish those who hid them or came to their assistance. But it was the jurists, the magistrates, and the demonologists, often embodied by the same person, who most contributed to the persecution. They were the ones who systematized the arguments, answered the critics, and perfected a legal machine that, by the end of the sixteenth century, gave a standardized, almost bureaucratic format to the trials, accounting for the similarities of the confessions across national boundaries. In their work, the men of the law could count on the cooperation of the most reputed intellectuals of the time, including philosophers and scientists who are still praised as the fathers of modern rationalism. There can be no doubt, then, that the witch hunt was a major political initiative. The political nature of the witch hunt is further demonstrated by the fact that both Catholic and Protestant nations, at war against each other in every other respect, joined arms and shared arguments to persecute witches. Thus, it is no exaggeration to claim that the witch hunt was the first unifying terrain in the politics of the new European nation-states, the first example, after the schism brought about by the Reformation, of a European unification. A first insight into the meaning of the European witch hunt can be found in the thesis proposed by Michael Taussig in his classic work The Devil and Commodity Fetishism in South America (1980), where the author maintains that devil-beliefs arise in those historical periods when one mode of production is being supplanted by another. In such periods not only are the material conditions of life radically transformed, but so are the metaphysical underpinnings of the social order — for instance, the conception of how value is created, what generates life and growth, what is “natural” and what is antagonistic to the established customs and social relations. Taussig developed his theory by studying the beliefs of Colombian agricultural laborers and Bolivian tin miners at a time when, in both countries, monetary relations were taking root that in peoples’ eyes seemed deadly and even diabolical, compared with the older and still-surviving forms of subsistence-oriented production. Thus, in the cases Taussig studied, it was the poor who suspected the better-off of devil worship. Still, his association between the devil and the commodity form reminds us that also in the background of the witch hunt there was the expansion of rural capitalism, which involved the abolition of customary rights, and the first inflationary wave in modern Europe. These phenomena only led to the growth of poverty, hunger, and social dislocation, they also transferred power into the hands of a new class of “modernizers” who looked with fear and repulsion at the communal forms of life that had been typical of pre-capitalist Europe. It was by the initiative of this proto-capitalist class that the witch hunt took off, as a weapon by which resistance to social and economic restructuring could be defeated. That the spread of rural capitalism, with all its consequences (land expropriation, the deepening of social distances, the breakdown of collective relations) was a decisive factor in the background of the witch hunt is also proven by the fact that the majority of those accused were poor peasant women — cottars, wage laborers — while those who accused them were wealthy and prestigious members of the community, often their employers or landlords, that is, individuals who were part of the local power structures and often had close ties with the central state. In England, the witches were usually old women on public assistance or women who survived by going from house to house begging for bits of food or a pot of wine or milk; if they were married, their husbands were day laborers, but more often they were widows and lived alone. Their poverty stands out in the confessions. It was in times of need that the Devil appeared to them, to assure them that from now on they “should never want,” although the money he would give them on such occasions would soon turn to ashes, a detail perhaps related to the experience of superinflation common at the time. As for the diabolical crimes of the witches, they appear to us as nothing more than the class struggle played out at the village level: the “evil eye,” the curse of the beggar to whom an aim has been refused, the default on the payment of rent, the demand for public assistance. As we can see from these cases, the witch hunt grew in a social environment where the “better sorts” were living in constant fear of the “lower classes,” who could certainly be expected to harbor evil thoughts because in this period they were losing everything they had. That this fear expressed itself as an attack on popular magic is not surprising. The battle against magic has always accompanied the development of capitalism, to this very day. Magic is premised on the belief that the world is animated, unpredictable, and that there is a force in all things so that every event is interpreted as the expression of an occult power that must be deciphered and bent to one’s will. Magic was also an obstacle to the rationalization of the work process, and a threat to the establishment of the principle of individual responsibility. Above all, magic seemed a form of refusal of work, of insubordination, and an instrument of grassroots resistance to power. The world had to be “disenchanted” in order to be dominated. By the sixteenth century, the attack against magic was well under way and women were its most likely targets. Even when they were not expert sorcerers/magicians, they were the ones who were called to mark animals when they fell sick, heal their neighbors, help them find lost or stolen objects, give them amulets or love potions, help them forecast the future. Though the witch hunt targeted a broad variety of female practices, it was above all in this capacity — as sorcerers, healers, performers of incantations and divinations — that women were persecuted. For their claim to magical power undermined the power of the authorities and the state, giving confidence to the poor in their ability to manipulate the natural and social environment and possibly subvert the constituted order. It is doubtful, on the other hand, that the magical arts that women had practiced for generations would have been magnified into a demonic conspiracy had they not occurred against a background of an intense social crisis and struggle. These were the “peasant wars” against land privatization, including the uprisings against the “enclosures” in England (in 1549, 1607, 1628, 1631), when hundreds of men, women and children, armed with pitchforks and spades, set about destroying the fences erected around the commons, proclaiming that “from now on we needn’t work any more.” During these revolts, it was often women who initiated and led the action. The persecution of witches grew on this terrain. It was class war carried out by other means. It seems plausible that the witch hunt was, at least in part, an attempt to criminalize birth control and place the female body, the uterus, at the service of population increase and the production and accumulation of labor-power. We can, in fact, imagine what effect it had on women to see their neighbors, friends, and relatives being burned at the stake, and realize that any contraceptive initiative on their side might be construed as the product of a demonic perversion. From this point of view, there can be no doubt that the witch hunt destroyed the methods that women had used to control procreation, by indicting them as diabolical devices, and institutionalized the state’s control over the female body, the precondition for its subordination to the reproduction of labor-power. The witch hunt, then, was a war against women; it was a concerted attempt to degrade them, dehumanize them, and destroy their social power. When this task was accomplished — when social discipline was restored, and the ruling class saw its hegemony consolidated — witch trials came to an end. The belief in witchcraft could even become an object of ridicule, decried as a superstition, and soon put out of memory. Just as the state had started the witch hunt, so too, one by one, various governments took the initiative in ending it. Once the subversive potential of witchcraft was destroyed, the practice of magic could even be allowed to continue. 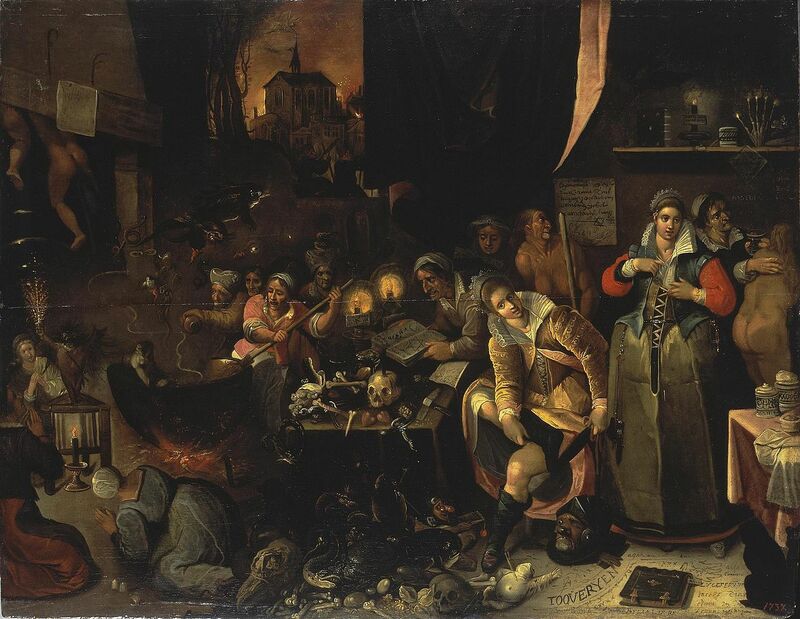 After the witch hunt came to an end, many women continued to support themselves by foretelling the future, selling charms, and practicing other forms of magic. But now the authorities were no longer interested in prosecuting these practices, being inclined, instead, to view witchcraft as a product of ignorance or a disorder of the imagination. Yet the specter of the witches continued to haunt the imagination of the ruling class. In 1871, the Parisian bourgeoisie instinctively returned to it to demonize the female Communards, accusing them of wanting to set Paris aflame. There can be little doubt, in fact, that the models for the lurid tales and images used by the bourgeois press to create the myth of the petroleuses were drawn from the repertoire of the witch hunt. Silvia Federici is the author of multiple books, including Calaban and the Witch and Revolution at Point Zero . She was was a co-founder of the International Feminist Collective and an organizer with the Wages for housework campaign.